Biscoff is back, back again! 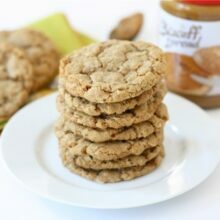 This time I used Biscoff Spread to create a fun and easy treat! These Biscoff Pretzel Bites with White Chocolate are too cool for school! I make these pretzel bites all of the time with peanut butter and milk chocolate, but I decided it would be fun to switch things up by using Biscoff Spread and white chocolate. I am glad I did because the combination is definitely a winner! 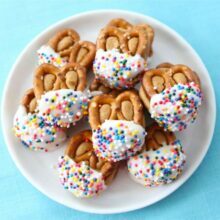 These pretzel bites are super easy to make. You don’t even have to turn on your oven. Yay for no-bake treats! The filling is made with Biscoff Spread, brown sugar, butter, and vanilla extract. The filling gets sandwiched between two pretzels. You do have to freeze the pretzels for about 30 minutes before you dip them into chocolate, so plan accordingly. I dipped the pretzels into white chocolate and added rainbow sprinkles for fun. Sprinkles make everything better! 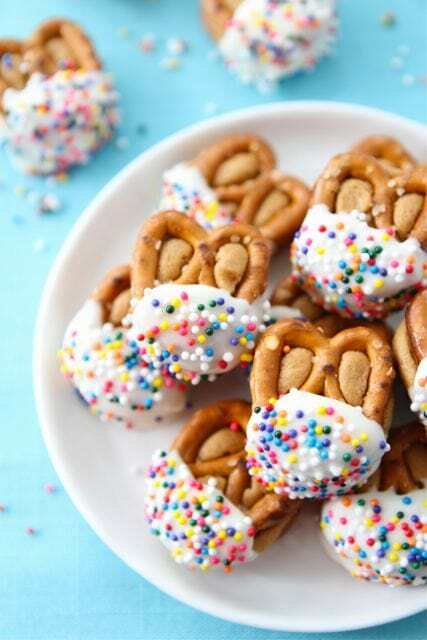 I love how bright and cheery they turned out:) These pretzels are a hit with the kiddos and adults. 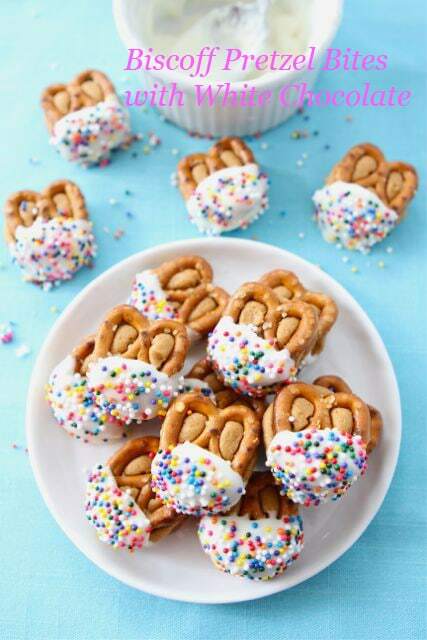 If you are looking for a fun and easy treat, give these Biscoff Pretzel Bites with White Chocolate a go. They are a great sweet treat for parties, game day, movie night, or every day snacking. Pretzels sandwiched with a sweet, creamy Biscoff filing and dipped in white chocolate. Finish them off with rainbow sprinkles for a fun, easy, dazzling treat! 2. Roll teaspoons of the Biscoff mixture into balls. Sandwich between two pretzels and put on a plate or cookie sheet. Freeze the pretzel sandwiches for 30 minutes. 3. Melt the white chocolate chips, using the microwave (30 second intervals) or a double boiler. Dip half of each pretzel sandwich into the white chocolate. 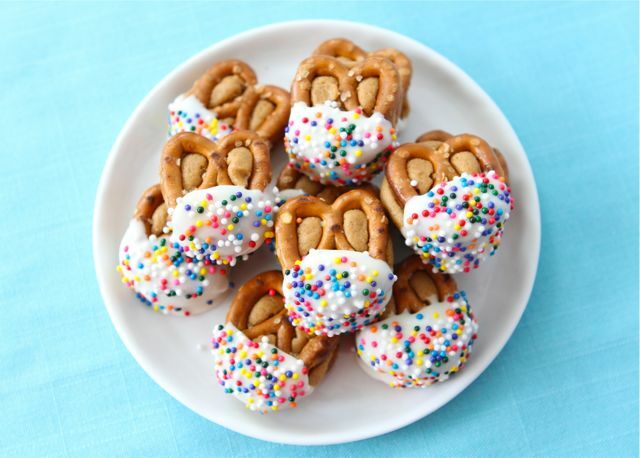 Sprinkle pretzel bites with sprinkles, if using. Return the tray to the freezer and chill until the chocolate sets. Store the Biscoff Pretzel Bites in the refrigerator until serving time. Note-look for Biscoff Spread next to the peanut butter at the grocery store. You can also order it online from Amazon. You can also use Trader Joe's Speculoo's Spread. Maria these are gorgeous! I love Biscoff and I’ve seen the recipes like this on Pinterest, Food Gawker but with PB..using Biscoff (and adding sprinkles!) is great thinking. YUM! What a perfect quick treat! Oh yum. 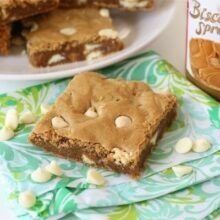 I’ve seen these with PB, you are a genius for using Biscoff (my favorite)!!! these look like one of those snacks i wouldn’t be able to stop popping. and i love it. Sounds soo good. Biscoff and white chocolate go together like peanut butter and milk chocolate…and salty pretzels go with everything:-). I might become obsessed with this! I love food that looks adorable and tastes great, too. 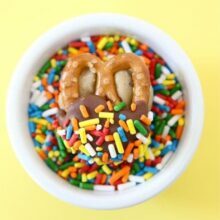 I cannot wait to make these cute little sweet treat snacks for the littles. These are adorable, I’ll take 10! What a perfect little sweet snack! 😀 Yay Biscoff! These look dee-licious and easy to make works for me! Oh, yum! I love chocolate-covered pretzels, so these are right up my alley! I wish you could buy biscoff spread in the UK – it looks and sound amazing! Those are so darn cute! My MIL loves making the pretzel bites, sending these to her! These would last all of 2 seconds in my house! What a great idea. Such a fun shape. Oh man, I am drooling at my computer right now!!!! Love the recipe! Oh biscoff…..how I love thee. 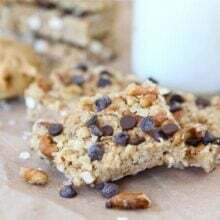 Love sweet and salty – these are perfect!! Oh so dangerous!! I’ve had something similar to these but they were pretzels with peanut butter dipped into chocolate. Must make soon! Man, I need to get my hands on some Biscoff! These almost look like little bunny ears. I’ll have to make these next Easter 🙂 They sound tasty too! Have a good week friend. where do you find biscoff? i can’t say i’ve looked all that hard for it, but it has yet to jump off the shelf and bite me at our favorite stores here! Look for Biscoff Spread next to the peanut butter. Most grocery stores are carrying it now. I know World Market has it too. Trader Joe’s Speculoo’s Srpead will also work! Wow!! Looks awesome. I love salty & sweet! So simple yet I’m sure incredibly delicious and addicting! Biscoff is my Nutella; that’s all I’m saying…well, except I can imagine it’s divine with some crunchy, salty pretzels. These are precious! I bet the salty + sweet combo is spectacular. These are so much fun! Plus, I can think of a million different variations on these – perfect party food. So fun! I need to give in and buy a jar of Biscoff! Oh, yum. You make me want to run to the store and buy some Biscoff right away! I tried these over the christmas holiday and LOVED them. Sigh..i heart biscoff. So fun! My kids would go nuts for these. Thanks for the idea. reason #4009 as to why Canada needs biscoff spread! SO brilliant, Maria! I love the combo of Biscoff spread + white chocolate. I bet the pretzels are an absolute perfect addition! These look incredible! The white chocolate with sprinkles reminds me of the frosted animal cookies. Definitely adding this to my list of things to make! These are super cute Maria! Maria, I make these with peanut butter and dipped in chocolate and each time i bring them somewhere, people RAVE about them. I’ve been trying to think of fun ways to change up the recipe a bit, so THANK YOU! I cannot wait to make these next time. Everything is better with sprinkles! Oh, I am loving this little bit of heaven! I’m new to the world of Biscoff but I am SOOOOOO on the bandwagon now that our local grocery store has started carrying the spread. Woohoo! Bookmarking this so we can totally try it soon. I just bought my first jar today! Biscoff is amazing so I’m sure this is amazing too! these are adorable! great combo! Such FUN little treats Maria! I have no doubt that once I’d start eating these, I wouldn’t be able to stop. They look completely addictive! oh my do these sound and look fantastic! That looks too cute to eat!!! What a fun colorful treat!! No bake and easy… Couldn’t be better!! These are adorable! I have to admit that I haven’t had biscoff spread yet. I know. What the heck? Need to get some A.S.A.P.! Unfortunately, I can’t buy this delish cookie spread where I live. Could it be substituted for peanut butter or another nut butter? These treats look yummy! I make them with peanut butter all of the time. They are good too! These are definitely your most addictive pretzel bites yet! I love Biscoff spread! Always looking for new recipes using it.. These look so good! My full on obsession/addiction/love-affair with Biscoff knows no bounds – and these quite possibly have overtaken my go-to PMS food of chocolate covered pretzels… Biscoff wins. Every time. These are beyond cute! Very creative and tasty looking! Any treat I don’t have to turn my oven on for is more than welcome in my kitchen this spring and summer! These look fabulous and SO festive! Love the sprinkles. I FINALLY got my first jar of Biscoff spread! These will be a nice, easy, tasty treat to make first. 🙂 Thanks, Maria! These are so cute, Maria! Caleb is going to be one lucky boy when he’s old enough to start eating your treats. These are so cute!! What a fun snack, definitely saving this! How fun and a great addition to any party! What a clever idea! Super cute & fun! Our girls would love to make AND eat these! These are WAY too adorbs and WAY too cool for me! Well, maybe not – I’m going to make these for my daughter’s next sleepover. Her friends will like me even more. 🙂 Thanks for sharing this recipe! These are sooo cute, and the sprinkles make them even better! sweet, salty, plus chocolate = yummy!! My kids would love these! We <3 anything with Biscoff! Adorable Maria. They remember me of sweet little bunny ears. I have been wanting to make pretzels; we are more savory pretzel eaters though. Maybe make the same cutest but with a mustard dipping sauce? Have you made savory ones? They look really delicious, I wish I could have eaten all the white chocolate biscoff pretzel bites at once. Yummy! How yummy is this? The perfect snack! I’m afraid to buy the TJ’s cookie butter because I think I will eat the entire jar with a spoon. Glad to know that I can make a tasty treat to share with it! These would be awesome for a kids’ party! So adorable! Whoa, these are just so pretty! And I recently tried cookie butter and cant even handle it’s goodness. Oh yum!